Description: The Physical map of Wyoming showing major geographical features such as rivers, lakes, topography and land formations. 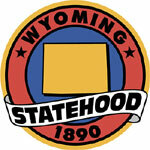 Wyoming is a state located in the western mountain region of the United States. It is the 10th most extensive state in the US. The western 2/3rd of the state is covered with mountain ranges and highlands in the foothills of the Rocky Mountains. The other 1-3rd of the state is mostly a high-elevated prairie called High Plains. Wyoming shares its borders on the north by Montana, on the east by South Dakota and Nebraska, on the south by Colorado, on the southwest by Utah, and on the west by Idaho. It is the tenth largest state in the United States in total area, containing 97,814 square miles and is made up of 23 counties. The Great Plains meet the Rocky Mountains in Wyoming. The state is a great plateau broken by many mountain ranges. Surface elevations range from the summit of Gannett Peak in the Wind River Mountain Range, at 13,804 feet, to the Belle Fourche River valley in the state’s northeast corner, at 3,125 feet. The State has a lot of high range Mountains and hills such as Rocky Mountains, Teton Range, Absaroka Range, Owl Creeks, Wind River Ranges that occupied most of the Eastern part, In the Central area Bighorn Mountains, Rattlesnake Hills, Shirley Mountains, Medicine Bow Mts. and Laramie Mountains are found. The Snowy Range in the south central part of the state is an extension of the Colorado Rockies in both geology and appearance. The Wind River Range in the west central part of the state is remote The Big Horn Mountains in the north central portion are somewhat isolated from the bulk of the Rocky Mountains. The Teton Range in the northwest extends for 50 miles, part of which is included in Grand Teton National Park. Counties and Road map and map image of Wyoming.